Outline Dean takes Jack to visit Donatello for some insight on living without a soul. Meanwhile, Sam and Castiel investigate unusual deaths in a town that's too good to be true. A terrified young man dressed in 1950s style clothing is running for his life as if chased by something. He arrives at Harrington’s soda shoppe and hammers on the door. A girl, Sunny, answers, he begs her to come with him but she says she can’t. They kiss goodbye and he runs away. He careens into a gas station, asking the cashier for his phone as the high pitched screeching in his head becomes unbearable. All of a sudden, he falls to his knees and his head explodes. Jack is in his room cradling Felix the snake when Castiel enters to ask how he is, and if he is at full power. Jack tells him he believes so, and to demonstrate, Jack makes a pencil dance in mid-air, but when Cas asks about his soul, Jack lets the pencil fall and becomes guarded. Cas leaves, frustrated, despondent and very worried. Dean is in the kitchen eating an enormous sandwich when Cas walks in. Dean says that he’s heard from Rowena and that she is coping and asks about Jack, which Castiel tells him he says he's fine. Asking about Sam, Dean says he is good too, which neither believe. In the map room, Sam begins to see the bodies of the murdered hunters. After gathering his composure, Sam enters the kitchen saying he’s found a case for them, and after protestations from Dean they decide that Dean should stay and look after Jack and Sam and Cas go deal with the case in Arkansas. Posing as FBI agents Sam and Cas question the cashier, Griffin, who saw man, Conrad Martin’s head explode. He tells them that he was probably from down the road in Charming Acres. 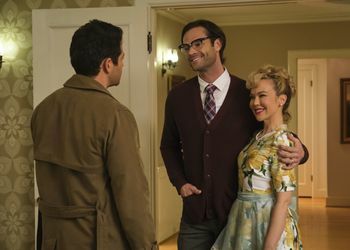 Sam and Cas arrive in what seems like a fantasy of a 1950’s town. They get out of the car and bump into a quaint couple -- Cindy and Justin Smith -- who suggest they go to Harrington’s soda shoppe for information about the recent death they are investigating. Before leaving, Justin becomes bemused by Sam's cell phone. At Harrington’s they sit at the bar, and are served milkshakes and meet the owner and mayor of Charming Acres, Chip Harrington and his daughter Sunny. The mayor tells them where Conrad was staying and Sam and Cas go to speak to the owner of the Dowlings Broading House. At the boarding house, the owner shows Sam and Cas Conrad’s room. Sam leaves with her for coffee while Cas searches the room finding some love letters from Sunny under the mattress. Sam suggests they stay because there is pot roast for dinner. At home Justin is repeating the words "cell phone" and seems to be remembering another life, including a daughter called Rose. He suddenly doesn’t recognize Cindy or where he is, as a high pitched sound begins in his head he runs screaming from the house. Making it halfway down the street before his head explodes. Driving on the road with Felix along for the ride, Dean tries to make conversation but is clearly awkward. He offers Jack angel food cake and devil's food cake. After much indecision Jack chooses angel food cake and Dean is visibly relieved. Back at the boarding house Cas is unable to find Sam. Worried, Cas arrives at Harrington’s and tries to question Sunny about Sam’s whereabouts. She tells Cas about Mr. Smith's death and tells him Sam came in earlier questioning her about it. Cas drives to the house and is met by a smiling Mrs. Smith who opens the door and invites him inside, offering him a martini. When he tries to tell her that her husband is dead she refuses to believe him. At that moment we see Sam wearing glasses and a cardigan, behaving as if he is her husband, Justin Smith. He doesn’t recognize Cas and when Cas tries to tell him who he is he throws him out of the house for using bad language telling him he should wash his mouth out with soap. Jack and Dean arrive at Donatello's home. Dean explains that Donny is an expert about souls and not having them, and leaves him and Jack to talk in the house. Dean waits, leaning against baby, a long way from Felix. In his kitchen, Donatello pours the two of them cups of coffee. Jack asks Donatello how he lost his soul, and learns how God's sister ripped it out of him. Donatello begins staring into the whirling coffee and milk describes what it feels like to be soulless and asks Jack how he feels, telling him he feels nothing. Jack tells Donatello that he doesn't feel nothing, but at the same time knows he doesn't feel the same either, and explains that he doesn’t want Sam and Dean and Cas to worry but at the same time he needs space. After telling Jack of his mantra of "what would Mr. Rogers do?" when he needs to "blend", telling him he is the best man that he knows, Donatello advises him to ask himself "What would the Winchesters do?". They re-join Dean outside and Jack goes to sit in Baby. Donatello doesn’t really reassure Dean, telling Dean if Jack says he's fine, he probably is, but that they should keep an eye on him, before telling him that Jack is probably the most powerful being in the universe. That night, Cas confronts Sunny inside Harrington’s accusing her of being a witch. She tries to run and his eyes glow blue as he threatens to forcefully remove the information from her head. Before she can answer him, The mayor, two henchmen and Sam as Justin Smith, arrive. He explains to Castiel how he came into his powers and that what he hopes for comes true… that people are happy. That he just wanted to save the town. A fight ensues where Cas singlehandedly knocks out both henchmen. Against his will he is forced to fight Sam who, straddled on top of him, threatens him with an angel blade. By reminding him of how Sam is feeling, and that if he loses himself he would be failing everyone they've lost as well as Jack and Dean, snapping Sam back to reality. Meanwhile, outside Sunny and her father are arguing. Chip casts Castiel into a bench and tries to make Sam’s head explode, but Sunny stops her father with her powers, leaving him trapped in a happy place inside his own mind. Jack and Dean return to the Bunker, telling Dean their trip was "illuminating". Jack goes to his room, leaving Dean just as confused as before. When Sam and Cas arrive, Dean teases Sam about wearing a cardigan and having a wife. As Cas goes to find Jack, Sam tells Dean how traumatized he feels over the hunters’ deaths, which is why he kept hunting non-stop, but that the Bunker is their home and he will need time to get over everything that happen. In his room, Jack starts talking to Felix, believing that Felix is missing his previous owner, he decides to reunite the two, by sending Felix to be with him in "Heaven", and proceeds to burn the snake into ashes as Castiel looks on concerned from the doorway. Castiel: Well, he says he's good, but what about Sam? Dean: He says he's good. I think they're both full of crap. Castiel: Love letters that were under the bed. They're from Sunny. Sam: Sunny. Sunny the milkshake waitress? Castiel: Yeah, and they're surprisingly passionate. Sam: Okay. Got it, yep, passionate. Understood. Jack: How did you lose your soul? Donatello: God's sister ripped it right out of me. That wasn't my best day. But oddly, it wasn't my worst day, either. Donatello: You know, Jack, our galaxy's all bright and shiny and spinny but in its center lies this very large black hole. It's the same with me. I'm all bright and shiny, obviously -- Not so much spinny. But inside? Empty. Donatello: I feel nothing. Losing your soul doesn't make you bad. It doesn't make you anything. It's um an absence of... of pity, of empathy... of humanity. Donatello: I'd keep an eye on him, but I think if he seems okay, he probably is. Dean: So he's not like you? Donatello: Oh, no. I'm a Prophet of the Lord, but he -- Jack's probably the most powerful being in the universe. I mean, really, who knows what's going on inside his head? Castiel: Sam, I know you want to be happy. And I know what it's like to lose your army. I know what it's like... to fail as a leader, Sam. But you can't lose yourself. You have to keep fighting. You can't lose yourself, because if you do, you fail us. You fail all of those that we've lost. You fail Jack. Sam, you fail Dean. Chip: No. No. In this town, I'm God. Sam: No. You're not. Believe me. We've met God. Castiel: God has a beard. Dean: Well, not a lot of happy goin' on around here. Sam: I hate this place right now. I hate it. Everywhere I look I see them. I see Maggie. I guess that's why -- why I was so desperate to get out of here, why I kept running us ragged. But I got to stop that. I-I can't keep running. I -- This is my home. This is our home. Dean, I think I just need some time. Jack: Cas says you miss your friend. You need help. Sam and Dean would help you, so I'll help you. I'll help you see your friend again. In Heaven. "Peace of Mind" was the final single released from Boston's self-titled debut album. Charming Acres references the 1998 film Pleasantville. In the movie, a brother and sister end up inside a 1950s black and white TV show, set in a small Midwest town, where everything at first appears perfect. Sam and Castiel use the aliases "Agents Scholz and Delp." Tom Scholz is a founding member and primary songwriter for the band Boston. Brad Delp was the lead vocalist for Boston up until his death in 2007. Griffin: He comes in looking like he's been running all night, asks for my phone, then he just... went all Scanners. Castiel: Was it more Scanners 1, 2, or 3? The 1981 horror movie Scanners and its sequels are about powerful psychics who can kills with their minds, making peoples' heads explode. Castiel: It's like were stepping into a "Saturday Evening Post". I look at them sometimes after you fall asleep at night. They're very soothing. The "Saturday Evening Post" is a magazine that has been published since 1821. The style of Charming Acres evokes the art of Normal Rockwell which featured on the covers for nearly 50 years in the mid twentieth century. Sam: Sir, using language like H-E-double hockey sticks! You should have your mouth washed out with soap. Castiel: I'm gonna... Double hockey sticks?! As a hockey stick's shape is similar to the letter "L" -- add two "L" after H and E spells Hell. Donatello: The best man I know. Fred Rogers was the host of children's television series Mister Rogers' Neighborhood (1968–2001). He was known for his kindness and friendliness. Donatello told Sam and Dean about his Mister Rogers mantra in 13.02 The Rising Son. The phrase "What Would Jesus Do?" - often shortened to WWJD - was popularized in the 1990s by U.S. Christians, as a reference point for their morality. Since then it has become a meme, where other characters or people are substituted for "Jesus". In 1.17 Hell House, Ed Zeddmore says "Okay, WWBD. What would Buffy do?" Bill Dow, who played Chip Harrington, previously played Dr. Kadinsky in 7.17 The Born-Again Identity. The episode opened with the scene from the end of 14.14 Ouroboros of Jack with Felix the snake, and cuts to the scene from 4.06 Yellow Fever when Dean is confronted by the large pet python. In reality it was Jared who was scared of the python. The town of Charming Acres was filmed in Cloverdale in Surrey, British Columbia. This page was last edited on 7 April 2019, at 01:42.